My use of the scenario edits has been limited to map-making until now, but I'm keen to try my hand at an actual scenario. I'm starting low-key with a scenario based on small ASL scenario. The map is done and I've added the forces. I'm starting on the AI plans for both sides next. How are the briefing maps created? I think I downloaded some graphics files once but it didn't seem obvious how to use them and I can't find them now. What is the best way to get a scenario tested and where is the best place to look for testers? I had thought it would be The Proving Grounds, but there seems to be little to no activity there. Are there any copyright issues with converting ASL scenarios for CMx2? Is it better not to use the original name and stay away from any reference to ASL? Where is a good source of copyright-free WW2 photos to use as the scenario image? I know Wikipedia specifies copyright details but I've head that this information isn't always correct. Any advice would be appreciated. I hope to have it in a ready-to-test state sometime in the next two weeks. TPGII (http://www.thefewgoodmen.com/tpg2/) has suffered benign neglect lately. I am in the process of developing a scenario designer's page at that site. I have another 1-2 weeks worth of work to do before completing that. I will post here when it is ready. Good luck with your own scenario! 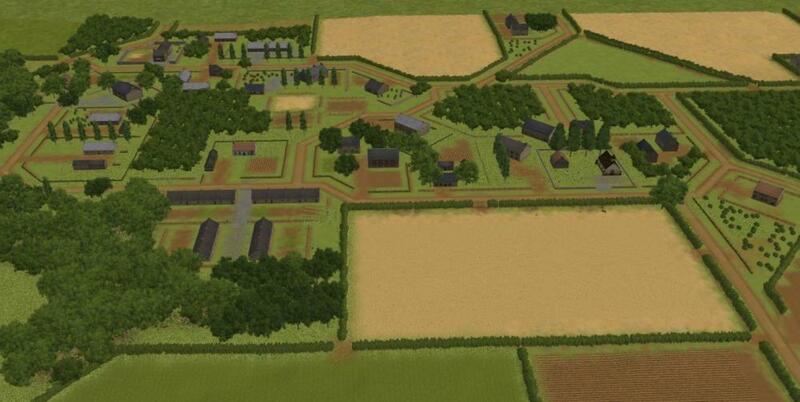 Indeed we have been putting a lot of work into the Scenario Depot and the Proving Grounds. Hopefully we can get the scenario design business sparked up again after a recent wane. I am actually in the process of creating a step by step tutorial. But I am not done and it is on the back burner but I'll share a draft with you via PM. It will get you started. Wow good question. It has been done before but that doesn't mean they were OK. Copyright does allow for derivative works, so as long as some things are different I think you can say based on ASL scenario X but I would make sure that there are differences and that you write your own briefing etc. And consult a lawyer. Actually I would use an image from game. During play testing take some screen shots and is those. I am in the process of developing a scenario designer's page at that site. My briefing graphics tutorial might be a good fit there. We should discuss that with @Bootie too. Whenever is soon enough. My intent is to build a "Scenario Designer Workshop" area on the TPGII Forum pages. While I have a bunch of references to organize and post initially, the vision is an interactive forum where designers can reach out to each other and post their own scenario design tools as well. No hurries. No worries. I'm not certain of the particulars of copyright laws other than the USA, but 70 years is the general copyright expiration for photographic images. Much of what you will find will be under "fair use", as the images were made by combat camera men and women working for their various national agencies- the US images will be fair use in that case. Copyright in photography lies with the creator of the image, not a secondary owner. Ownership of a print or negative without having created a work does not constitute any sort of exclusive rights. Copyright transfer/extension is rare, and Disney or Warhol estate level of insane. Since the people that made the images in question are now most certainly dead, you are generally going to be in the clear (though due diligence as to credit is encouraged). That would be a great help, thanks. On balance, I think it would probably be best to fictionalise/genericise it and say it's "inspired by...". This one, by the way is...(ahem)...inspired by the ASL Starter Kit Scenario "Ad Hoc at Chef-du-Pont", which can be downloaded for free from the MMP web site. Excellent idea. That's what I'll do. IP issues come more into play when someone is making money off the IP. I would say that so long as you claim it's for non-profit/educational use, it's not a problem. Fair use allows limited use of copyrighted material without permission from the copyright holder for purposes such as criticism, parody, news reporting, research and scholarship, and teaching. There are four factors to consider when determining whether your use is a fair one. @Holditgood luck with your plans. Don't sweat the briefing graphics thing - it is easy peasy. I do mine in Powerpoint and most are generally a Google Earth image of the map or an overhead CM screenshot of the map in preview mode. All I do then is draw a few arrows, add some military symbols and write in some text or other annotations. Once I've done that, I just 'select all' on the slide and copy into Paint where I resize them to the correct dimensions and save them as 24 bit Bitmaps. I think that many people have this perception that you have to use some Gucci graphics program like Paintshop Pro, be a ninja at using it and spend hours at it. Utterly not true - most of my Mission graphics I can knock up in under an hour using Powerpoint and Paint. All explained here in my CMSF mission design tutorial. @Holdit- This is completed now. 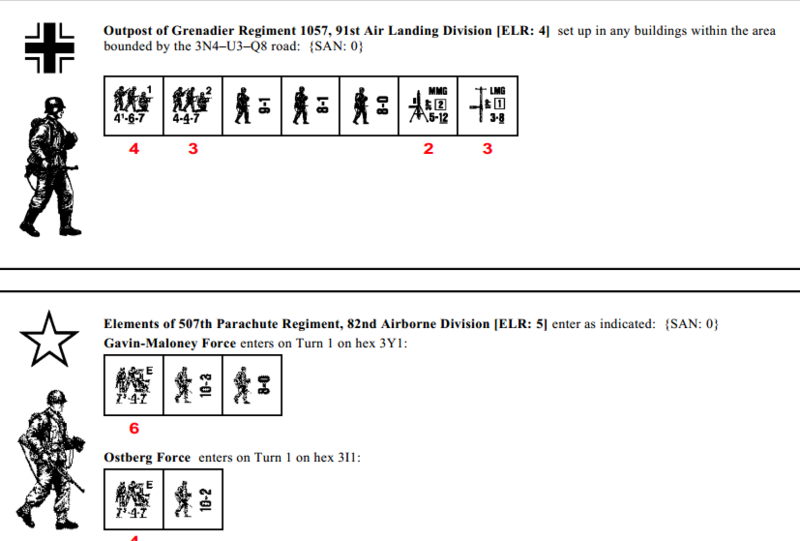 The TPGII webmaster and I discovered that "No plan survives contact with the enemy" in scenario design either. The Proving Grounds II does not effectively support a viable scenario design discussion forum. Anyone can view the information posted there. However, you have to be a registered member of FGM to post comments and questions. Please let @Bootie or me know what you think. So, all designer's and those interested in combat mission scenario designer resources, "Cry 'Havoc' and let slip scenario's aplenty!" Good luck and good game designing. 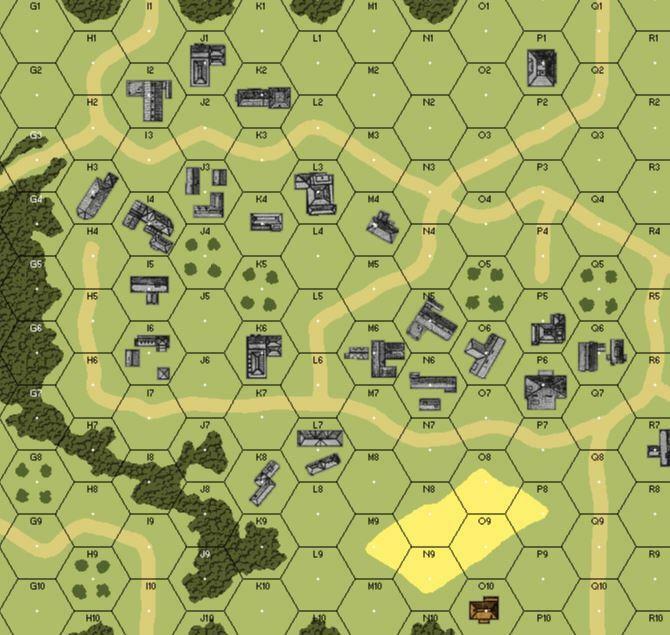 those interested in combat mission scenario designer resources, "Cry 'Havoc' and let slip scenario's aplenty!" Good luck and good game designing. The briefing templates from some of the BF games were released on the repository years ago. These were transferred over to CMMODS. If you have some basic skills with photoshop or other programs that open .psd files it will save you some work in prepping breifing graphics. Trying to find the balance for victory points can also be a bit of a challenge. I created a simply excel file that lets you test different combinations of victory point assignments, and potential points gained by players on both sides so you can 'game out' your scenarios. I stupidly overwrote my scenario file (no version control or backups) and had to start the whole thing from scratch, but after some time away at last the new map is nearly ready. I've also added the forces, setups and victory conditions so it should be ready for testing soon. For the OOB, I've create two groups for the Americans, the Western Group and the Eastern Group as per the OOB below. Because of the situation with mis-drops on 6th June, I've reduced the American headcount to 70%, which is (probably understating it even at that). I've made the Americans "Crack" or "Veteran" and "Fit" with "High" motivation. The Germans 4-6-7s are "Regular" and the 4-4-7s are "Green", with "Normal" motivation and "Typical" fitness. @Holditwell done for hanging in there after losing the original. Sounds like a labour of love, which generally results in better scenarios. I'm just doing it to punish myself for being so stupid in the first place. Oh man we have all done it. I have a batch script that uses the command line interface to winzip to zip up my research and scenario files. It keeps the last 10 copies and puts the newest one on dropbox which then syncs to a couple of other computers. Done for the day - click a short cut and a couple of minutes later its all backed up. Amen to that.....The sheer number of times I've been distracted and closed the editor without saving is really quite embarrassing (especially as it warns you to do so)! Saving alone isn't the answer. I was saving...but I made a change to the mission parameters or something and saved what I thought was a change to the existing scenario over the scenario file. So when I opened it up again I got the default small map. 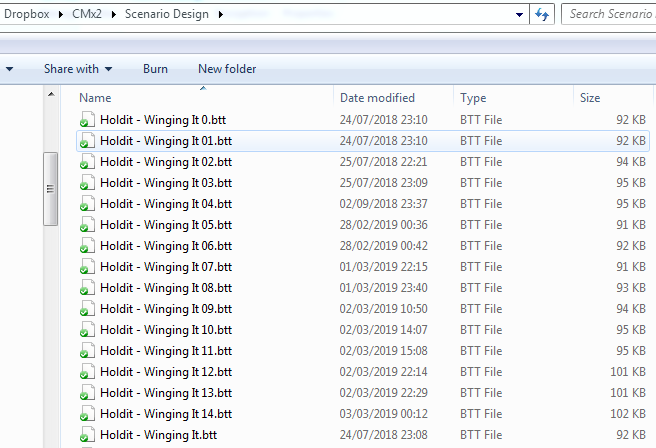 I'm still not sure how I managed that, but I must have created a new scenario and saved that over the existing file, but anyway the answer isn't just saving, it's saving versions, so if the worst happens you don't lose everything. I don't create a new version every time I save, of course, but I do try to create at least one per day, so that if the worst happens I'll only need to redo a single evening's work. I also store backups of the lot in Dropbox. As for orders maps, in the editor if you go to Mission (Axis) for example you will see four tabs marked 'Strategic' 'Operational' 'Tactical' and 'Text'. The map tabs give you the preferred art size in pixels: 224 x 224, 702 x 224, and 952 x 350. The preferred art format is .bmp. This is your own scenario so you can put anything you want into those orders map locations. Screenshots of the 2-D map, hand-scribbled art, art from ASL, Calvin and Hobbes cartoon panels. Put as much or as little work into it as you want. I'm at the point in a scenario where I'm setting up the victory conditions and AI plans. The Allied force, U.S. Airborne approaching from the northwest and northeast, has to exit off a road on the south edge of the map so it can secure an important bridge (off-map). The German forces are more or less in the centre of the map. The second question is more complicated. The original ASL scenario's victory conditions state that the Americans win if they exit 1 or more squads at that point, but that if the German player exits y squads from the same point, then the American player must exit y + .5 squads. My first thought was to simply discard that part of it and just make the fight for a couple of key points in the village and near the bridge exit, but from my reading I reckon I could have the exit point as a trigger that would start the Germans falling back toward the bridge when the first U.S. unit touched it. This might make for a more interesting fight, with the Germans "realising" that the Americans have got through or around them, and displacing to bolster the bridge's defences, and the American player needing to decide which forces to exit and which to leave as a rearguard/exit block to prevent the German player from getting his forces off. It could even play out as a running gunfight with multiple units from both sides head for the exit at the same time. This is possible, by painting different areas in the 'Setup' section of the AI orders, however the units will not necessarily be set up with much precision within those painted areas. I'll defer to others on the issue of Triggers, @MOS:96B2P.....You out there? Personally I wouldn't use 'Destroy All' - it is very binary and I think limits your flexibility with VPs, my preference is always to go with 'Destroy'. That said, I'm not familiar with the victory conditions in the original ASL scenario that you're trying to replicate. As to the trigger thing, there is something clearly going on if only one unit is moving and this is not happening all of the time and you're not getting the 'wait for' dialogue. I'm no expert on triggers having only just successfully used them in the last six months or so but one thing I would consider is having a dedicated trigger objective rather than doubling up on the exit objective. It might be that units exiting on the exit objective are not hanging around long enough for the trigger to fire. Try drawing a trigger objective adjacent to the exit objective and see how that works as a starter for ten. I guess though for us to really understand what's going on, you're going to have put up some screenshots or provide more detail.